Valentine’s Day means chalky candy hearts with a lot to say. But what’s behind these very loud little candies? The story of conversation hearts began in 1847, when a Boston pharmacist named Oliver Chase longed for a way to get in on the lozenge craze. Lozenges were quickly gaining steam as the medicine conveyance of choice, and were also popular remedies for sore throats and bad breath. Oliver had inadvertently created America’s first candy-making machine, and before long, he had abandoned his pharmacy business to crank out miles of what would become New England Confectionery Company (NECCO) wafers. Oliver had built his candy empire, his brother Daniel decided he wanted a piece of the action. Inspired by the growing market for Valentine’s cards, Daniel wondered if it would be possible to print sentimental messages on candy. In 1866, he figured out a way to print words on candy with vegetable dye during the cutting process. 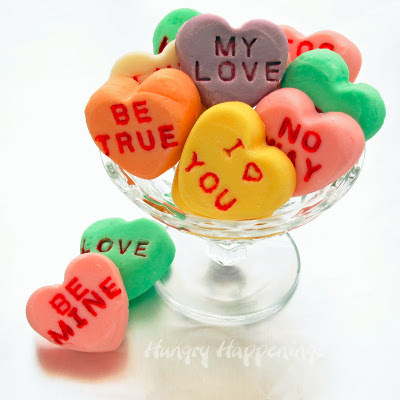 People loved conversation candies (they weren’t available in heart shapes until 1902) and their witty messages, which could stoke the flames of love or warn off flaky suitors. Conversation hearts have lost size over the years, but gained many more phrases. Among this year’s selection? BFF, TE AMO, and GIRL POWER. From mid February through January NECCO produces 100,000 pounds of the hearts each day in preparation for Valentine’s Day. This makes Sweethearts the most popular Valentine’s candy, even better than a box of chocolates!